This exceptional table is one of our best-sellers - and it's easy to see why. 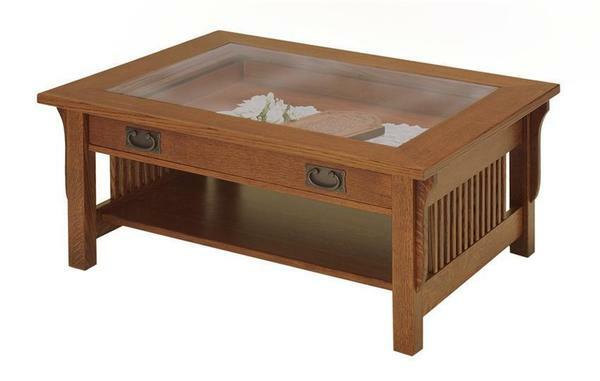 At the heart of the Lancaster Mission Glass-Top Coffee Table is a uniquely beautiful tempered glass panel resting atop a wide display drawer that's ideal for treasured mementos, precious trinkets, and favorite decor. The strength of the glass means that it will happily serve decades' worth of coffee cups, books, magazines and other living room essentials without cracking or breaking, always keeping its precious contents protected, safe, and easy to enjoy. The rest of the table - all handcrafted to order in solid native wood - is just as stunning, providing a flawless support for the display case while bringing a true sense of classical Mission style to the home. Every element of the Lancaster Glass-Top is built to order in a small Amish woodshop in the northern United States, promising you nothing but the best in home-grown quality and attention to detail. Your Lancaster will be crafted, finished, and then sanded by hand using the materials you choose from the menus above. Simply make your wood and stain selection to get started. Interior drawer is plain, not stained. "Mission" accomplished! I just wanted you to know that the table has arrived. It is absolutely gorgeous and exceeds my expectations. I can't wait until my husband gets home and sees his "surprise"! Please pass along my great admiration and appreciation to those who crafted such a work of art, and for those who ensured it reached our home here in Maine.